» A 1001 MIDNIGHTS review: H. C. BAILEY – Mr. Fortune Objects. A 1001 MIDNIGHTS review: H. C. BAILEY – Mr. Fortune Objects. 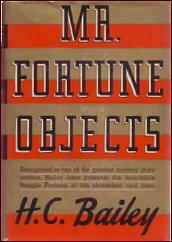 H. C. BAILEY – Mr. Fortune Objects. Victor Gollancz, UK, hardcover, 1935. Doubleday Crime Club, US, hardcover, 1935. One of the most popular of British Golden Age sleuths is H. C. Bailey’s Reginald Fortune. Reggie is a doctor whose deductive abilities and refusal to take the facts at face value make him an invaluable asset to Scotland Yard’s CID, and he is often called in as scientific adviser on particularly difficult cases. Fortune, whose plump appearance and fondness for gourmet foods belie his dogged devotion to the pursuit of justice, appears in ten novels and fourteen short story collections. Mr. Fortune Objects contains six stories (aptly termed “objections” because Reggie persists in taking exception to the obvious solution to each of the cases presented to him). In “The Broken Toad,” he investigates the mysterious poisoning of suburban Police Constable Mills, the circumstances of which are “rare and bafflin’ ” and the solution to which is sure to surprise the reader. “The Three Bears” takes us into the art world, exposing its hypocrisies and affectations, as well as its murderous passions. And in “The Yellow Slugs,” Fortune probes into the reasons a young boy attempted to drown his sister, reasons that he thinks are not as simple as the boy claims. “The Little Finger” deals with arson, jewel theft, bloodstains, and a missing digit. “The Angel’s Eye” is an entertaining house-party mystery. And “The Long Dinner” concerns a missing painter and a menu that makes gourmand Reggie’s mouth water. Fortune, his boss Lomas, Superintendent Bell, and Inspector Underwood have delighted readers for years. The Reggie Fortune stories are soundly plotted and their logic is impeccable. One might complain of the weak development of secondary characters and somewhat pretentious dialogue, but all in all these remain good light reading. 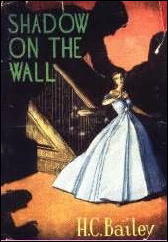 The better of the Reggie Fortune novels are Shadow on the Wall (1934), The Bishop’s Crime (1941), and The Life Sentence (1946). Particularly good among the short-story collections are Mr. Fortune Explains (1931) and The Best of Mr. Fortune (1943). 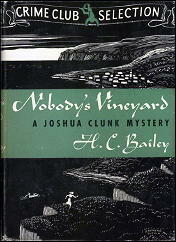 Bailey’s other series character, lawyer Joshua Clunk, “a champion of the weak and oppressed,” is considerably less interesting-perhaps because he appears only in novels and Bailey was a much better writer of short stories than a novelist. The ten Clunk books — among them The Red Castle Mystery (1932), Nobody’s Vineyard (aka Dead Man’s Shoes, 1942), The Wrong Man (1945) — are well plotted but are written in a much more turgid style than the Reggie Fortune series. That would be a mad humility, and you’re neither humble nor mad. Amen. So be it. Praise God for all. Why then, what is it that you fly from? The job and the job masters. Even as I. You from His Highness the Town Clerk and the Circumlocution Office and the Mayor and Aldermen and Councillors. I from a misbegotten Editor, poorfish, and the slavery of cooking stories of tripe and the plague of fools who want to be in them or kept out of them. Previously on this blog: Combined earlier into one post, Curt Evans reviewed both Mr. Fortune Objects and Clue for Mr. Fortune. I suppose that quoted bit was Clunk? He can be rather a pain! I’m getting used to Reggie though, at least in the short tales.